There was a time when Inma Gomes would have topped the charts with her bluesy R&B and wild voice, and with any luck there will be again. 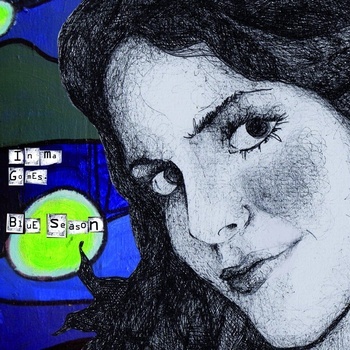 Her four track LP, Blue Season definitely has throwback appeal, for those that like their r&b with a lot more blues and jazz than what passes for R&B these days. Gomes is backed up by a bass and guitar and that's it; no gimmicks, no attempts to add a sweeping orchestral movement, or dance beats to the proceedings. Of course the focus for this record is on Inma's voice, and she doesn't hold back. With the warm bassline, “Other Moment” sees her reaching for the top of her vocal register, with silky smooth results. In fact the bass has very warm sound to it through the entire EP, moving from the funky groove slaps on 'NOW' to backing melody on “SHE”, and it's really nice to hear more than a typical 'walking bass' holding up the low end, especially when drum and bass tend to sound similar all the time when jazz and blues are heavily influencing the music. Which is not to deride the guitar work, as it's suitably low key behind Inma's voice (it grabs your attention on “SPACE” quite nicely), it just doesn't stand out as much to me as the bass does. There is some dirtiness to the instruments though, occasional off notes, they both have an almost impromptu, live sound that doesn't come off sounding polished at all, but is infinitely more listenable for it as far as I'm concerned. If you need something a bit mellow, a bit funky, with a great voice, then Blue Season is the EP to grab.